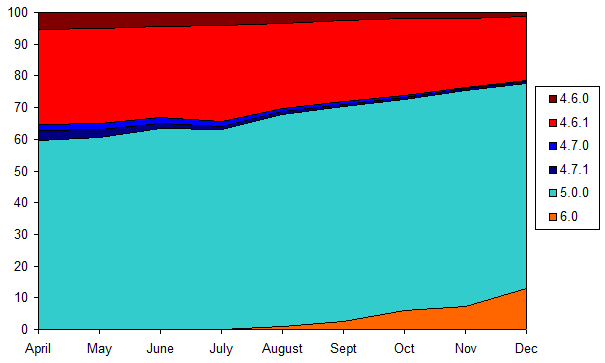 The above chart shows BlackBerry OS usage since April 2010. Note that usage of OS 5.0 or higher has increased from 59.6% to 77.7% in the past 8 months. Also both OS 4.6.0 and 4.7.x have both decreased from around 5% to almost nothing. Usage of OS 6 meanwhile remains relatively low, but has seen larger growth in the past month (partially due to the release of the 9780). As usual this data is taken from the very popular BlackBerry strategy game Pixelated. Data starts from the release of version 2.0 in April of 2010. See also Novemeber OS usage as seen by the Hockey Scores application.